"I've learned how I want to live my life, with an open heart and constant curiosity." 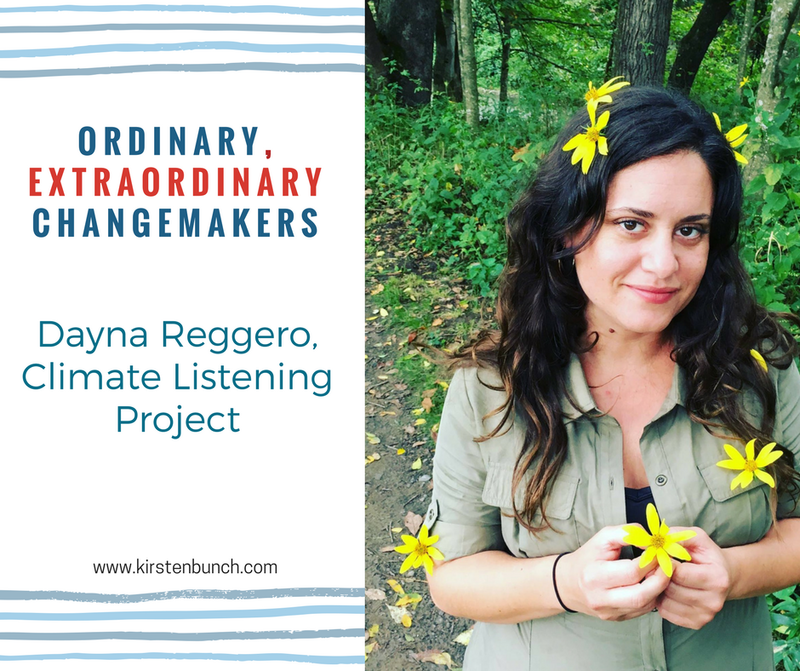 Dayna Reggero is the Founder and Director of the Climate Listening Project. The Climate Listening Project explores the connections that are important to each of us: family, faith, business, community; and weaves together the latest science with inspiring stories from around the globe. I started the Climate Listening Project three years ago. It's been an honor to meet and listen to individuals across America and around the world. My whole world has been opened up. I want people to feel like they can be their true selves, that they can lay everything on the table, their struggles, joys, and hopes, and feel heard and supported. Whether it’s for a documentary or just an everyday conversation, I try to create a safe place for people to laugh, cry, and speak their truths. I've learned a lot. I'm listening. I'm learning. And, my hope is that this is what people do when they watch the Climate Listening Project videos. It's not just one type of person that's impacted by climate change. It's all of us. It comes to your backyard. It comes to the children we want to be healthy and safe. It comes to the bird that you love to see every spring. It’s comes to the food we eat and the farmers that want to be able to hand their farms down to their children. In the beginning, I filmed people myself with my little camera. I didn’t know what I was doing. I didn't have the right sound equipment, I didn't have the right anything. But, I just wanted to do it. So I did it. I know what I want to do. I am an environmentalist and connector. I don't know exactly what tools I will use in the future, but I know who I want to be and how I want to contribute. Or at least I know that I want to contribute. More than ever in the decades that I've been alive, now is a scary time. It's like - "Come on! What are we going to do?" If I were to give advice to somebody, it would be that if you have an idea, just do something, anything. Get it together, know what it is that you are passionate about, and just keep trying. For me, I've learned that it's really about being on a journey every day. And I've learned how I want to live my life, with an open heart and constant curiosity.